Mobile health and mobile fitness (mhealth and mfitness) are both growing trends demonstrating the ever-growing influence of mobile devices in our everyday lives. Developments in the quality of mobile devices has seen them become integrated into both of these industries. Juniper Research has recently released a report on this, titled “Mobile Health and Fitness”. 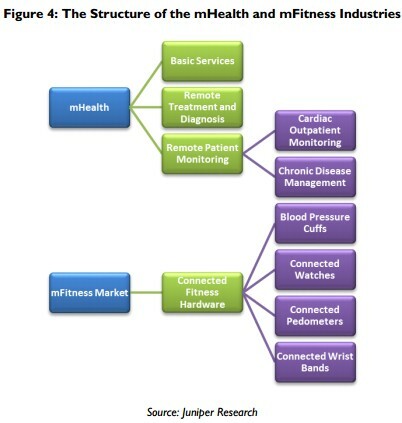 Mhealth is both a newer and less known concept, involving the remote treatment and diagnosis of patients, and this ultimately helps lower running costs for health establishments. Use of mobile devices also allows hospitals to conduct ongoing patient management remotely and this includes managing those with chronic diseases. Mfitness is something that we are much more familiar with and many of us use mobile devices in our fitness regimes. Fitness apps and devices such as Nike Watches and connected pedometers serve as motivation for many and allow us to monitor our results more effectively. In terms of impact, mhealth is arguably far more powerful than mfitness and Juniper’s report predicts that it will help save as much as $36 billion in the next 5 years. The highest savings, unsurprisingly, will be made in North America.